According to the Wechat postings of one of its members, the judicial reform office of the Supreme People’s Court has been working overtime for months to prepare for the 4th Plenum. It appears, at least from the initial 4th Plenum communiqué, that the hard work has paid off. We will know more about the leadership’s plans for legal reforms when the full decision is released. Four quick questions about the communique are set out below (to be supplemented as time permits). 1.The communique stressed the need for improving the quality of legislation, including incorporating more public consultation and experts. Will this reduce the need for judicial interpretations? What will this mean for the drafting of judicial interpretations? Will the Supreme People’s Court require public consultation for its own judicial interpretations? The release this month of drafts for public comment of the environmental public interest litigation regulations and the trademark validity administrative case rules are a step in the right direction. 2. The communique called for greater judicial transparency, as was highlighted in the Court’s 4th Five Year Reform Plan. In its press releases to the domestic audience, the Supreme People’s Court has mentioned the visits it has hosted of the foreign press, foreign diplomats, and ordinary citizens, and of analogous events at the local level. When can we look forward to easier access by all (foreign or domestic) to proceedings in the Chinese courts (at least in non-sensitive cases)? 3. 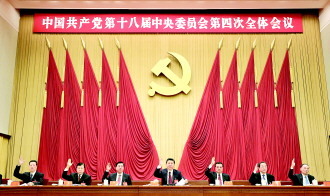 The communique indicated approval by the leadership of the establishment of circuit courts that cross administrative lines, a concept mentioned in the 4th Five Year Reform Plan (see this earlier blogpost). It also reflects the use in China of foreign legal concepts or frameworks (as is frequently stressed, a reference and not as a transplant). 4. It also called for an end to “interference” by leading cadres in specific court cases. How will this long-standing practice will be curbed? In recent weeks, articles have appeared in the legal press on changes to the Party Political Legal Committees. Will those changes imply less involvement in actual cases? And what is the distinction between “interference” and “leadership”? This entry was posted in Communist Party and the Courts, Court Operations, Court Reform and tagged 4th Plenum, Central Committee of the Communist Party, judicial interpretations, Plenum, public consultation, Supreme People's Court.